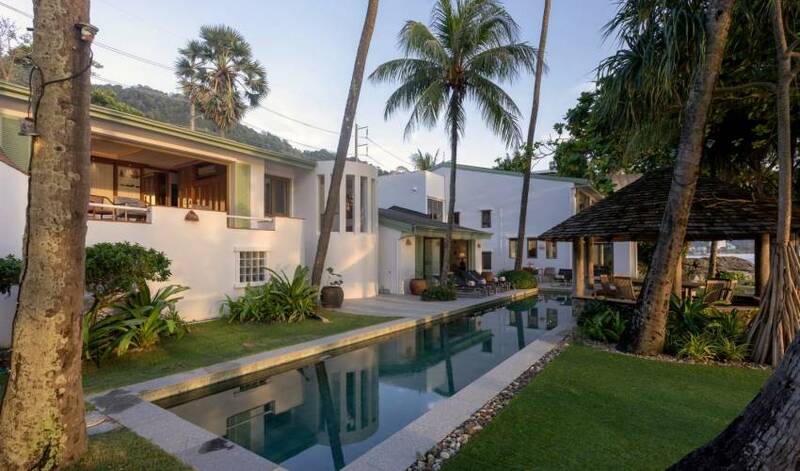 Villa 4358 was the very first beach house in Phuket, built long before any roads criss crossed the island with cars. 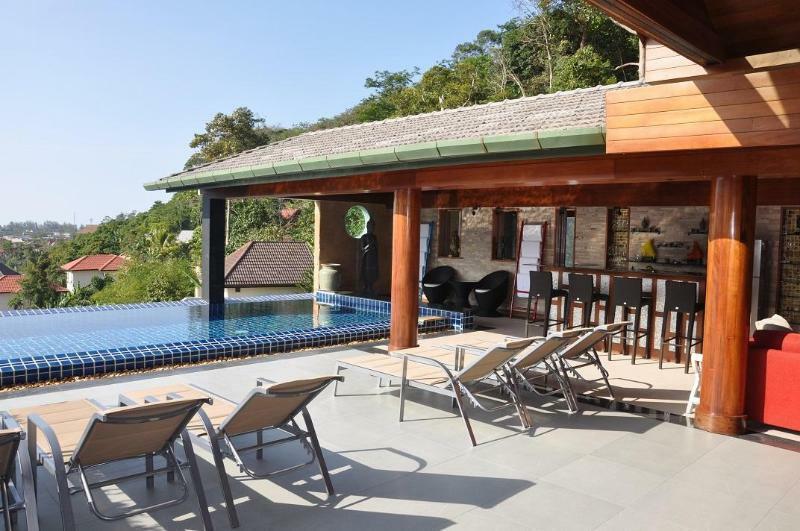 Over the last 30 years, it has been added and improved to the point it is a wonderful relaxing beach house that sits comfortably on its private beach, rather than a purpose built villa high-end on the hillside. 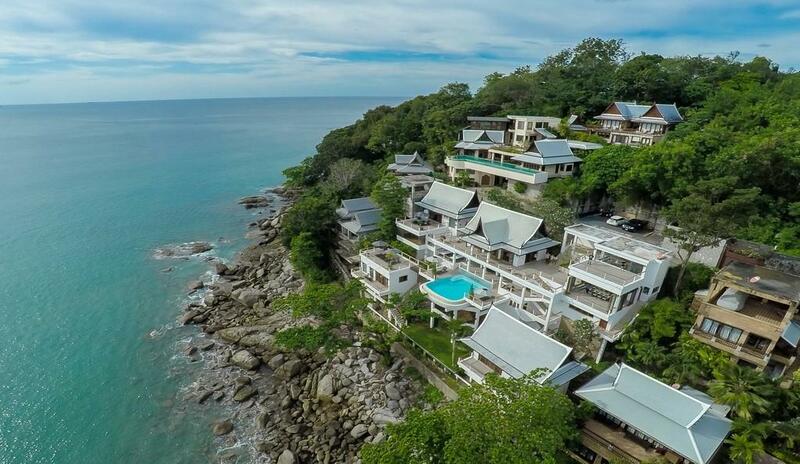 The villa sits directly on the sand at Kalim and enjoys breathtaking West Coast sunset views over Patong Bay. At high tide the water is good for snorkeling right in front of the villa out to a protected reef. At low tide, the beach is rocky and exploring the rock pools and reef walking is best done with old sports shoes. No jetskis, no beach sellers, no hassle. 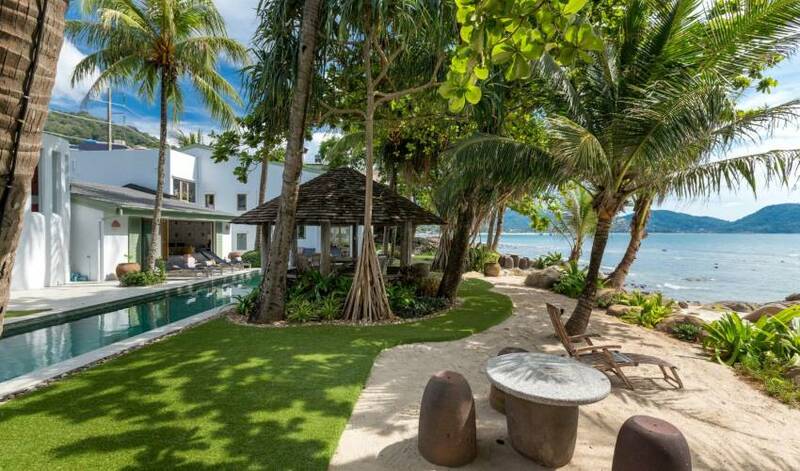 This villa is all about the beach and outdoor living. The 17 meter salt chlorinated swimming pool with built in Jacuzzi are right outside your lounge and the only thing between you and the beach – all yours to enjoy. 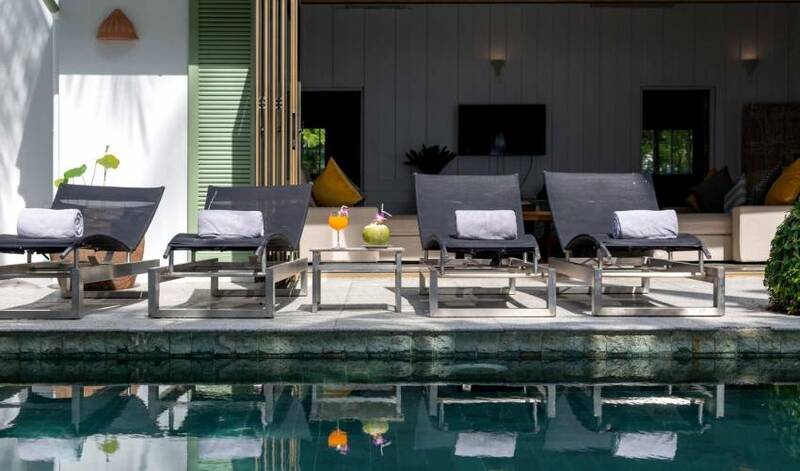 Surrounding the pool are modern pool recliners and oversized beach towels as well as a range of seating options and the poolside sala. 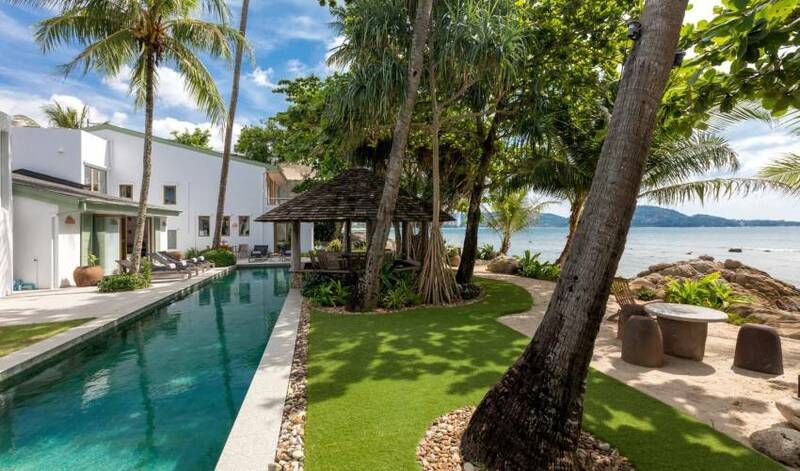 On the lower level of the villa are 2 bedrooms – each with private ensuite. One of the bedrooms is a double, the other is a twin. On the top level are 2 double bedrooms that share a bathroom. One of the bedrooms has a small lounge with flat screen TV and an extra fold out sofa bed which is ideal for any young children that might need supervision. The other bedroom is as close to the lapping water and sand as you can possibly get, and has a large folding glass doors that open out on to a private balcony with fantastic views of the ocean and across to Patong Beach. There is another single bedroom and a separate sofa bedroom that are available, but we recommend these only for children or maid staff as they are smaller rooms, but perfectly comfortable. 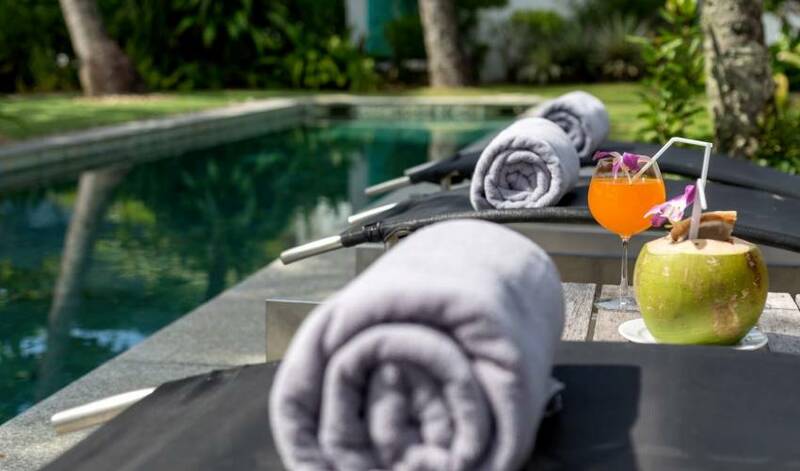 All 6 bedrooms are fully air conditioned and furnished with lovely fresh linens and towels, as well as robes and slippers to relax around your Villa. The lounge opens up full width to the pool for maximum indoor/outdoor living. It has a large flat screen TV with DVD player and satellite connection to HBO, CNN, Star Sports, E, cartoon network and another 50 or so English speaking channels. Just send us your list of some movies you’d like to see whilst you stay in the Villa and we’ll be pleased to have them ready and waiting for you. The fully equipped kitchen is where you meals will be prepared by our resident Chef or you are welcome to use yourself. Her specialty is Thai food, but she can cook up a good English breakfast, poolside snacks or BBQ and whip up a tasty fruit shake. Just let us know what you would like to eat and we will buy it fresh daily at the markets and charge you only what it cost us. Preparation is complimentary. We will put bottled water and a few cases of soft drinks of your choice in the fridge for your stay, with our compliments. And if you want some things bought and waiting for you at the Villa before you arrive, just let us know and we’ll be happy to do it for you. 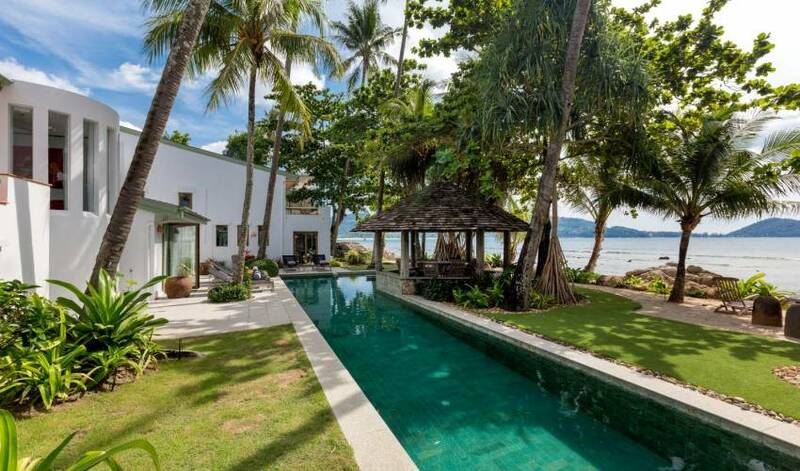 You can dine at the indoor dining table, or you can sit at the outside pool sala and have the best beachside dining in Phuket - all in your private villa. Both seat 10 people. If you must stay connected with the office during your vacation you have a few options. 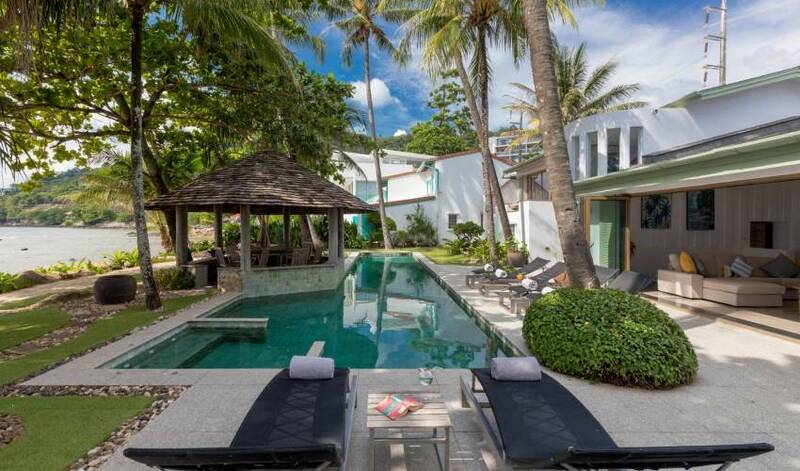 The villa compound is one of the only villas in Phuket to offer a complete business center, complete with 7-seat boardroom table, computer, printers, copiers and 2Mbit Internet connection. 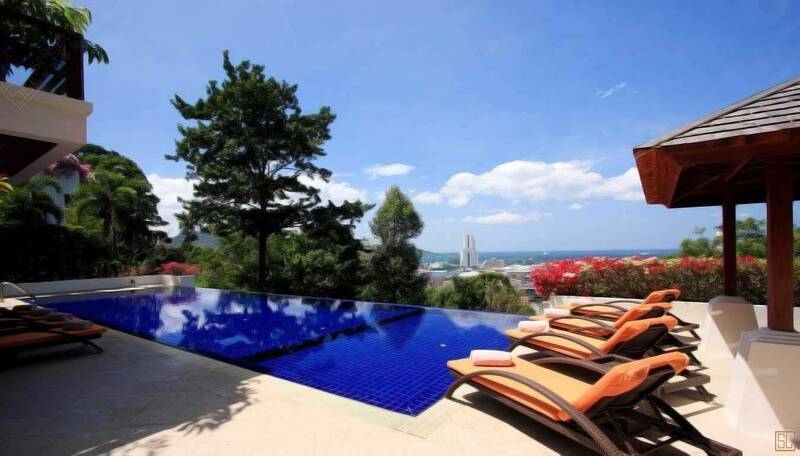 It also has the very best views of any business center in Phuket with 180 degree ocean front location. But if you would rather sit by the pool with your laptop, the Wi-Fi extends throughout the villa and is complimentary. Our resident staff will keep the villa clean and comfortable and the Villa Manager speaks perfect English and will help you with anything you might need, from recommendations, bookings, transport and advice.